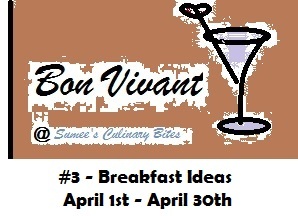 Blogging Marathon#15, officially begins today. 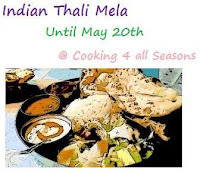 But the for those like me, whose chose to blog on Traditional Thali Menu, the preparations started a month before.From today I will be Posting Thali Menu for the Next 7 days. My People @ home had a great time, enjoying the Thali , which I planned & prepped during the Weekends. They now want me Cook Something like this every month, but that request came with a condition, No Detailed Photo-Session PLZZZZZZZZZZZZZZZ!!!! My Hubby even commented that even the photographer in our marriage didn't shoot our marriage menu this way. 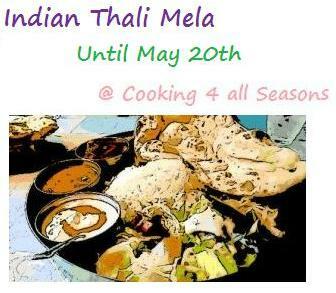 I have Planned the Menu for the 7 days as Breakfast Thali ( 2 Nos), Lunch Thali (5 nos) 1 Festival Thali and 1 Dinner Thali. Hope you all find it interesting and enjoy the menu as much as we enjoyed it. Soak the Rice and Urad Dal separately for 4-5 hours.I usually Soak them Morning and Grind the batter by Afternoon 2 or 3pm. Drain the excess water from Dal-Fenugreek and grind it to a smooth batter, adding little water. When the Ural Dal Batter froths up while grinding, it is considered done. You get the 'cluck, cluck' sound (air in-between the batter) while grinding.Transfer it to another Vessel. Drain the excess water from Rice and Grind it to a smooth batter. Mix Rice batter with urad dal batter and Give it a good stir. Let it Sit on the Kitchen top Overnight for fermentation. The Vessel should be big enough to hold the fermented batter. I always keep the vessel on a plate, to collect the over-flowing batter. Next Day morning, Mix the batter well with a laddle and take the required amount of batter for making idly/dosa and Keep the remaining batter in the fridge. Add Salt and a tbsp of Gingely oil to the batter taken out for making Idly/Dosa. Mix well. Coat the idly plate/mould with gingely oil and pour half ladle of batter in each mould. Steam Cook for 10 minutes or until done. When done, take them out, let it cool for a minute or two. Remove the idlies on to a plate and Serve Hot with Sambhar and Chutney. If you are in a hurry and want to unmould the idly immedialtely, just show the back of the idly plate in running water for 2-3 seconds, it will be easy to unmould them. Do not try to remove the idlies while they are hot, you wont have perfect shaped ildy. What is the Mazza/Kick in a Shape-less Idly!!!! Grind with the rest of ingredients to a smooth paste using 1/4 cup of water. The amount of water depends upon how thick/thin you want your chutney. We prefer our Chutney to be thick. so i add little water while grinding. This is My Kuttu's Thali, his Favorite Idly in his Boat Bowl, Peanut Chutney and Pediasure!!!!! Transfer it to a bowl. Heat Oil given under tempering, splutter mustard seeds, add hing and pour it over the Chutney . Enjoy with your Favorite Idly/dosa. I even try to have this chutney mixed with Rice. Love it!!!!!! wow that a wonderful thali n i love everything in it..
Thats a filling breakfast and very inviting too.I use green chillies for this peanut chutney will ty with red chilies next time. Omg, its been ages i had this kind of breakfast thali,makes me hungry Priya..drooling here..
Soft idlis with spicy peanut chutney would surely make a great combo..cant wait to see your other thali specials. Wow awesome Priya..looking forward to all your thalis..great to know you made so many thalis all together!.. :)..I love idli with peanut chutney, my favorite anytime.. I use green chilies & lime juice for the peanut chutney. That is a delicious thali. Wow tat was delicious looking... Just love the soft idli n the chutney..
idlis look so nice and fluffy and I've never had peanut chutney! i love thaalis and peanut chutney is my family's fav too! LOL at your husband's comment about the wedding photographer not clicking so many photos. That's a lovely thali, Priya. The idlis look super soft. The idlis look so soft..wish it was in front of me..loving the peanut chutney too...super platter..love it!! never used this ratio of rice:urad dal. but the idlis are super fluffy. can have these anytime with sambar and peanut chutney! LOL!!! It's the same scenario at our house about the photo session. Love the thaali Priya....best breakfast thaali anytime!!! Nice one. thali looks superb, the idlis look really soft and fluffy! All time favourite, awesome plate breakfast thali.., can I send my family to you!! Lovely thali !! Idlies looks super soft. Waiting for the other recipes !! Super combo. Oru sweet iruntha kalayana breakfast. Love this combo. I add garlic to peanut chutney.